If you're not into politics, feel free to skip down to the picture. Federal Treasurer Joe Hockey has a had a bad week. Tasked with the job of a selling a budget no one likes, Mr Hockey decided to dismiss the concerns of "the poor" by saying they won't much be affected by a rise in the fuel excise, because they don't drive cars anyway. He went on to describe the fuel excise as a progressive tax, and became possibly the first treasurer in history to not know what "progressive tax" means. In fact, he might be the first high-school graduate in history to not know what progressive taxation is - assuming he graduated. Challenged over his insensitivity, he dug in his heels and said the statistics backed him up. Unfortunately, he couldn't find any actual people who would back him up, not even among his closest workmates, and eventually began to realise he might need to give up and say "sorry". And say sorry he did. Although, reading the full transcript of his on-air apology, it mostly seems like he's sorry people noticed that he's completely out of touch with the needs and concerns of low-income Australians. If he wants to remain as Treasurer, he really should have apologised for not understanding basic tax philosophy. 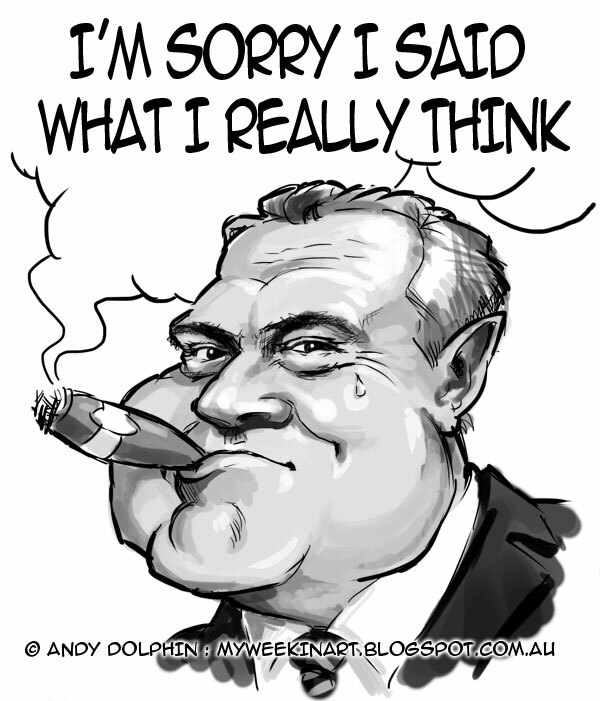 Anyway, that was just a long explanation of why I felt compelled to do another Joe Hockey caricature.